I may have achieved ‘culinary goddess’ status last night. Well, at least John thought so. 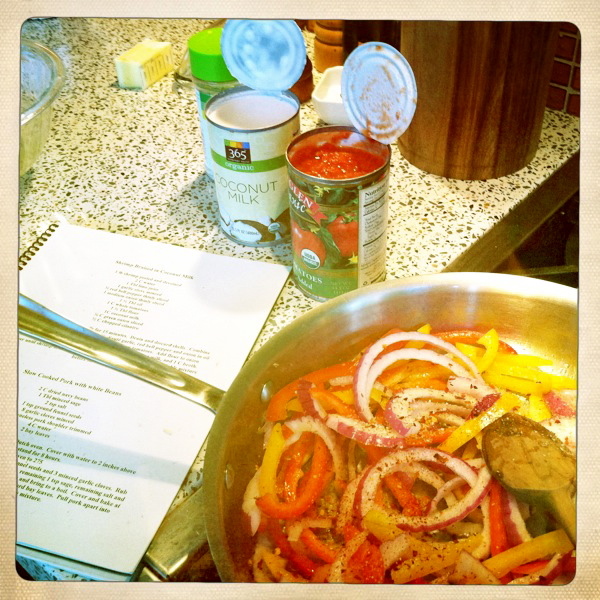 I needed a new recipe to try for my weekly challenge, and it was Meatless Monday. 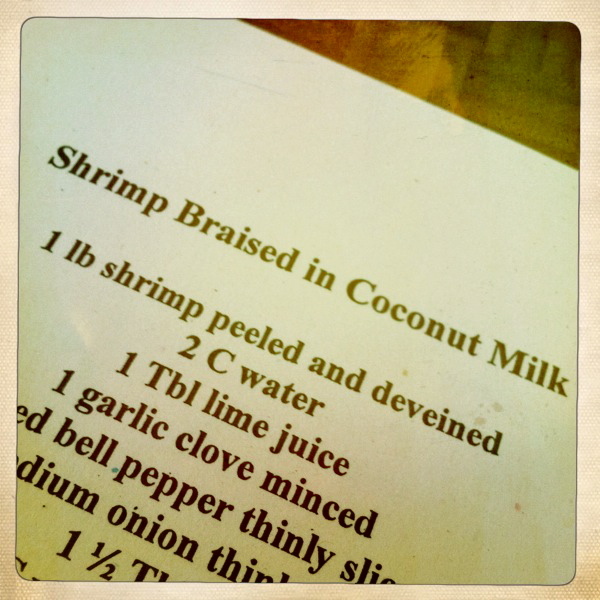 After looking through a binder of delicious recipes compiled by a dear friend, I settled on Shrimp Braised in Coconut Milk. 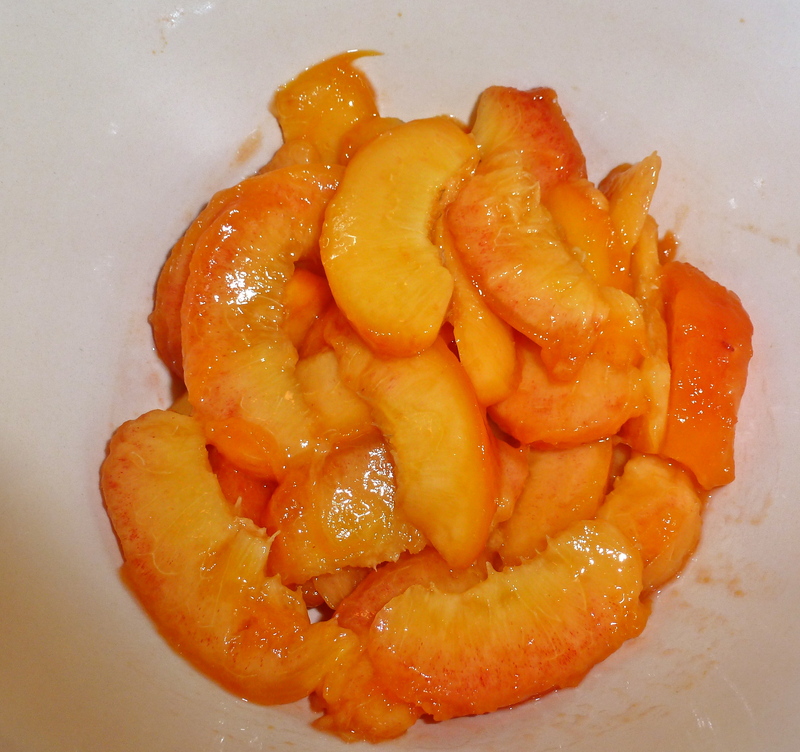 I also had a bowl of nectarines that I wanted to be sure did not go to waste. What better way to make fruit disappear than to transform it into a crumbley, tart dessert? Ya. I did that. It was a new recipe twofer. 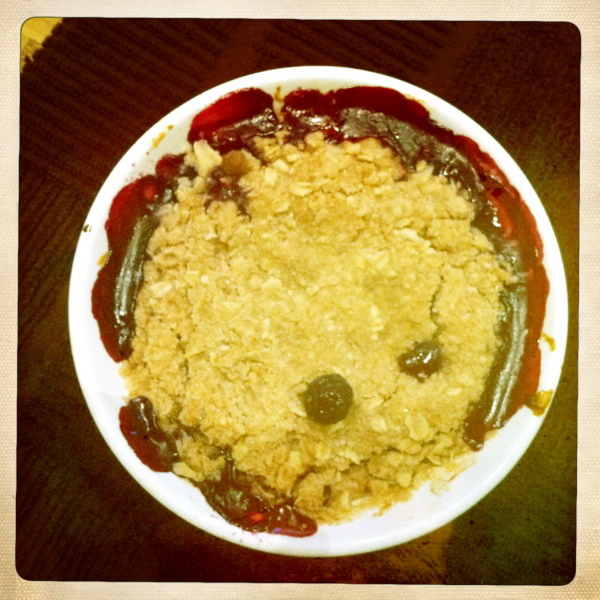 I put the crumbles together first so they could bake during dinner. Now, I’m not a pie person. I’m not generally into warm fruit at all. 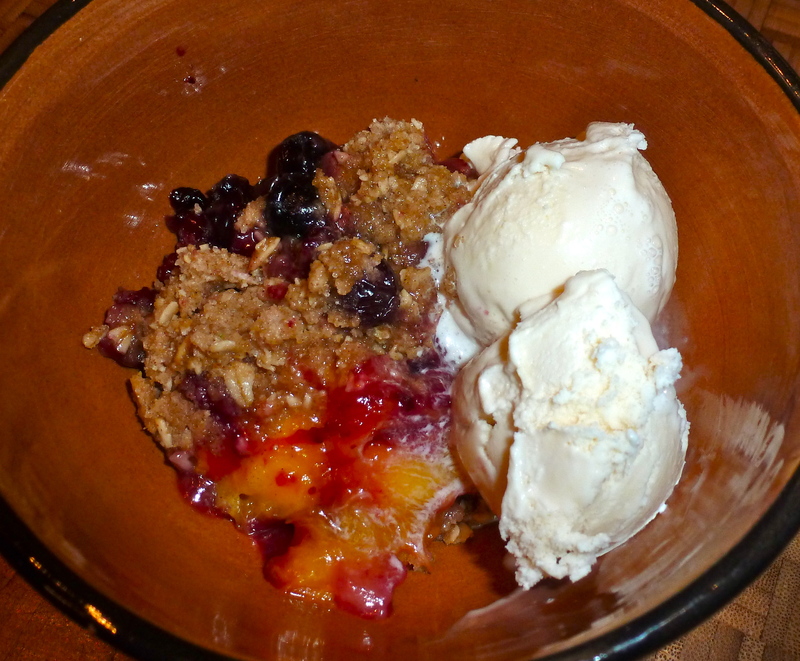 But I have been known to pick off all of the sweet crumble topping- so I decided to just make more of that. I took tips from a couple of different recipes and thought, I’ll just wing it. How bad could it be? 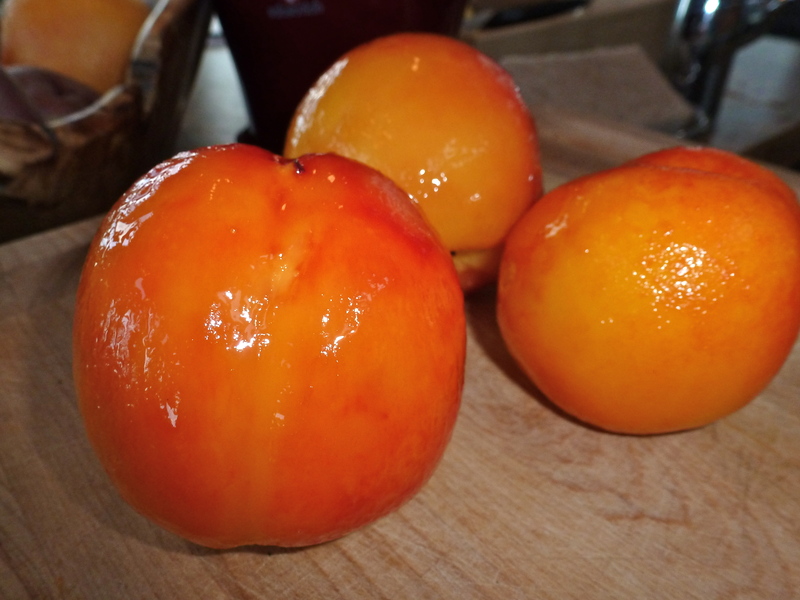 The hardest part of the process was peeling, pitting and slicing the nectarines. I’d never boiled fruit before. 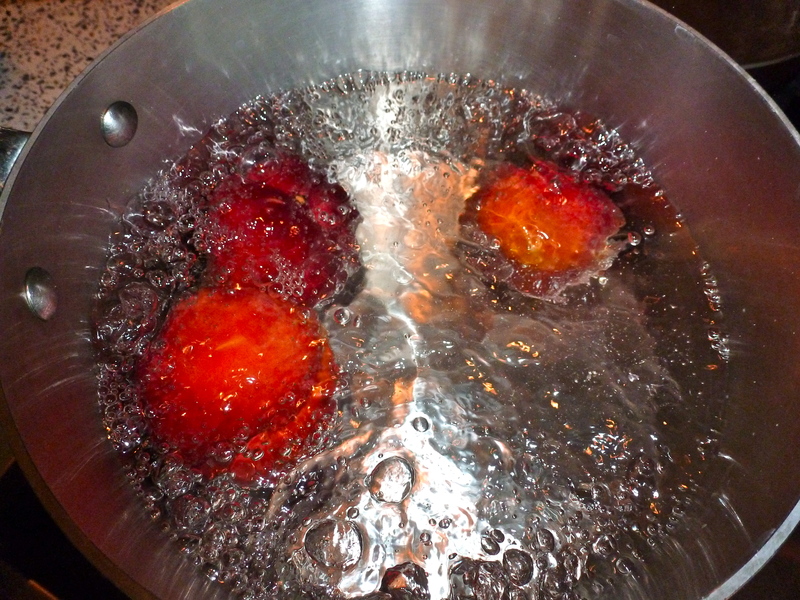 The skins did slide right off, but the fruit was slippery and difficult to hold steady. (Not ideal when one is wielding a sharp knife.) I ended up with a bowl of sliced fruit and all of my fingers intact. Score! 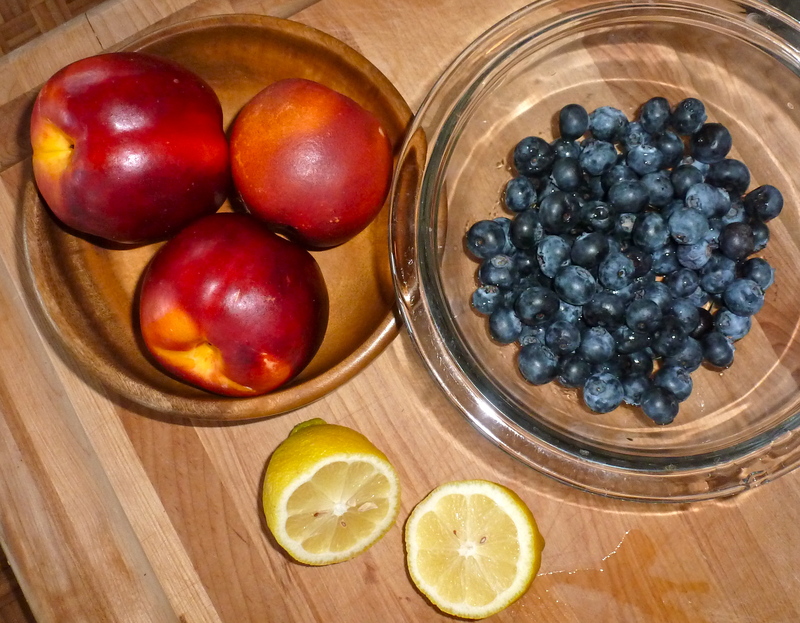 I threw in some sugar, some fresh blueberries to increase the summer quotient, some lemon juice and zest, and a smidge of flour. 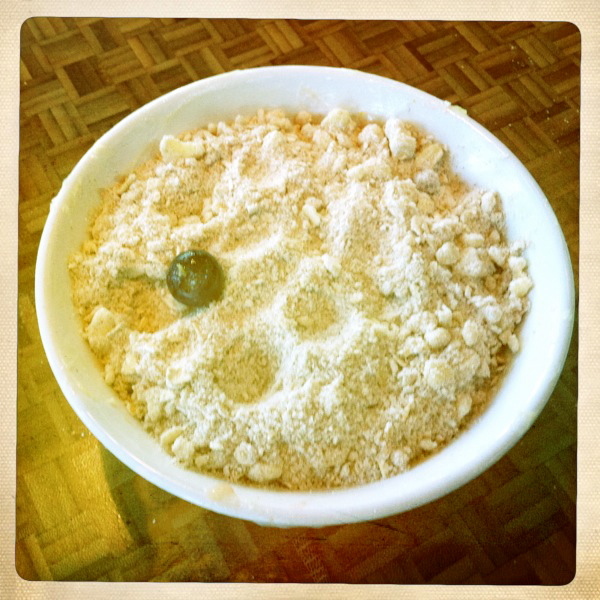 The topping was just flour, sugar, brown sugar, cinnamon, some oats, and cold butter, pulsed together in the food processor. I covered the fruit with it and hoped it would all come together in the oven. 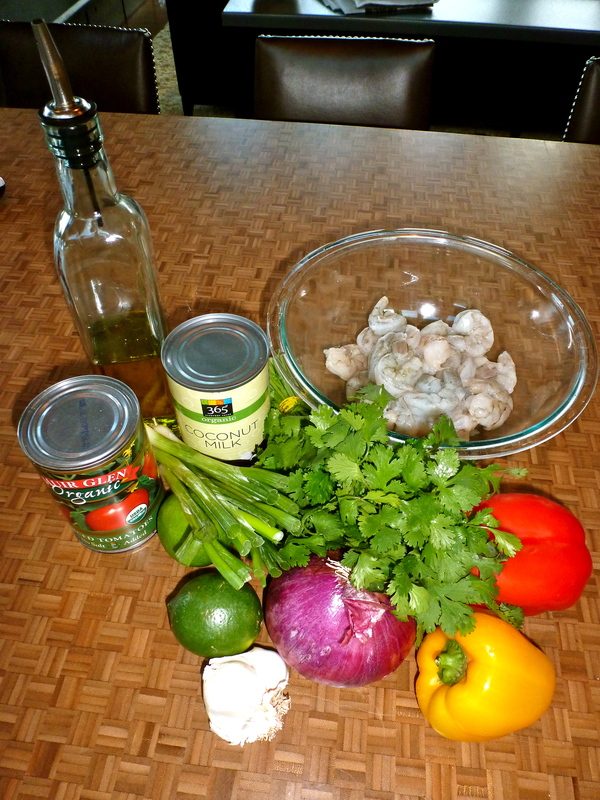 The recipe was not difficult, but had a few steps I wasn’t used to, like making a fishy broth by boiling the shrimp shells and marinating the shrimp ceviche-style in fresh lime juice. 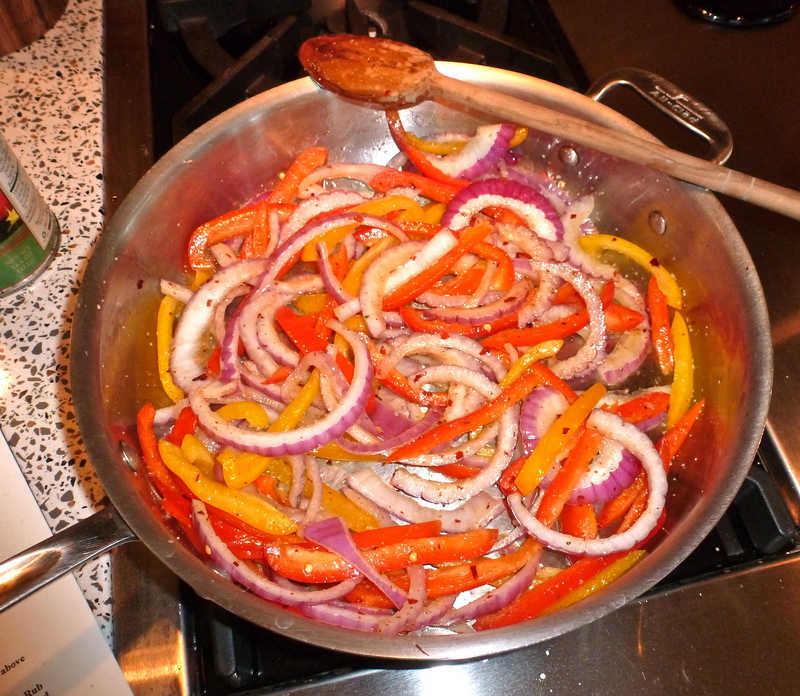 I sautéed some veggies and garlic, tossed in some diced tomatoes, and added some heat with crushed red pepper. 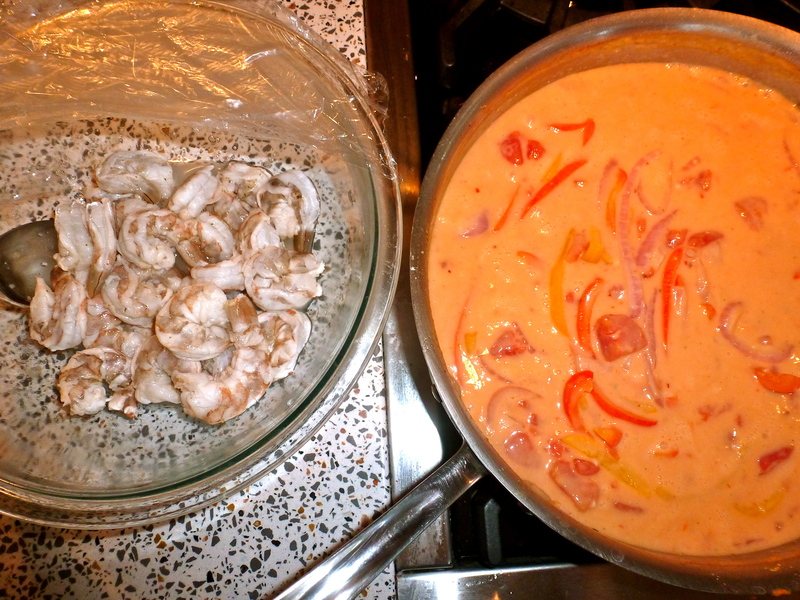 All of the components ended up in the pan together and simmered away with a cup of coconut milk. 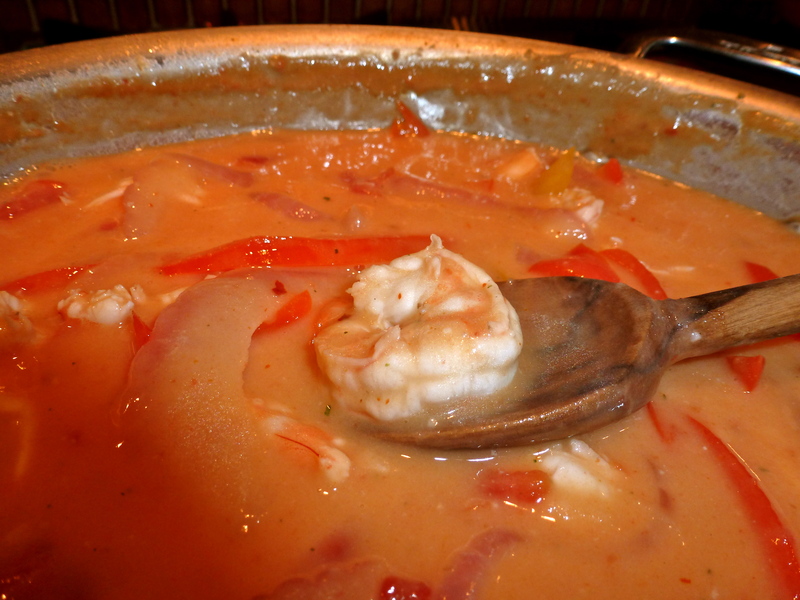 As the sauce thickened, the Thai aromas led John into the kitchen by his nose. 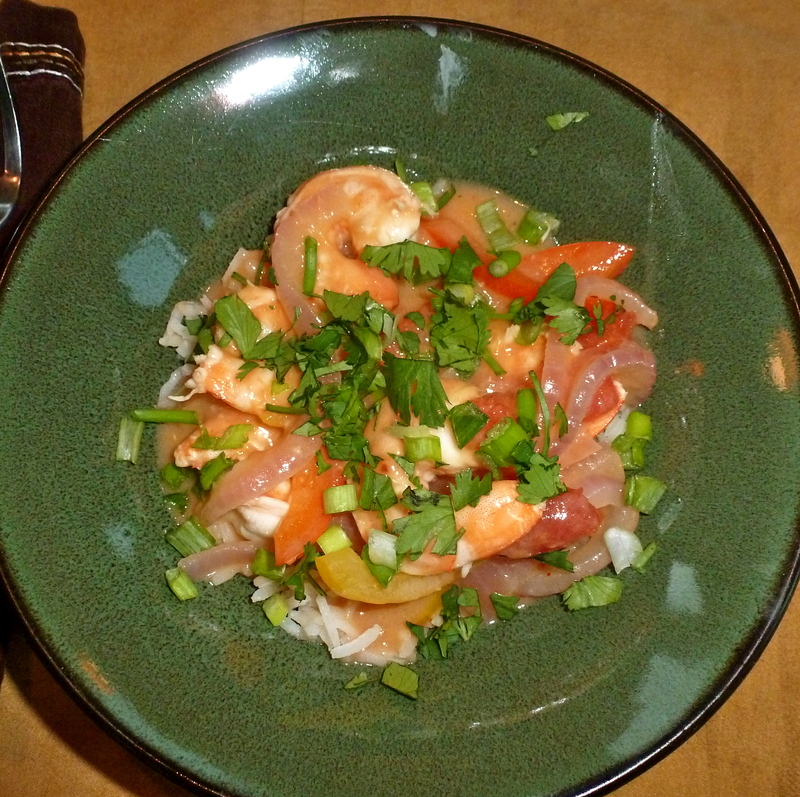 I served it over basmati rice with fresh scallions and cilantro sprinkled over the top. 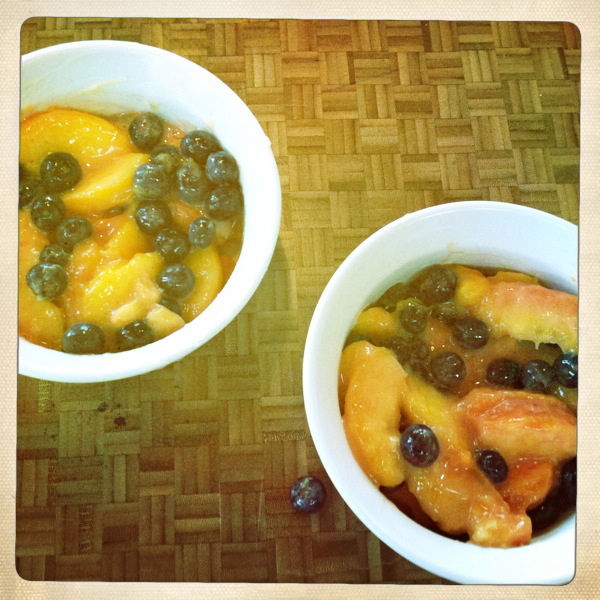 It was a surprisingly light dish with bright flavors, perfect for summer. It was REALLY delicious! But let’s not forget about our good friend, Mr. Crumble. A few peeks into the oven revealed browning and bubbling. It looked incredible cooling on the counter. I scooped some nectarine-blueberry goodness into a bowl with some vanilla ice cream and awaited the verdict from my faithful taste-tester. He said I was a culinary goddess. I added another scoop of crumble to his bowl. Because it would be rude to argue. Previous postJust go with it. Good on ya, you culinary goddess, you! I would love to cook an involved meal like this. You’ve inspired me…I think my boyfriend would keel over on the spot. The dinner itself wasn’t too complicated, but trying to get both dinner and dessert going at the same time was a bit of a juggle. You can do it if I can! Thanks for reading about it! I wish I wasn’t eating a boring omelette right now after reading this! 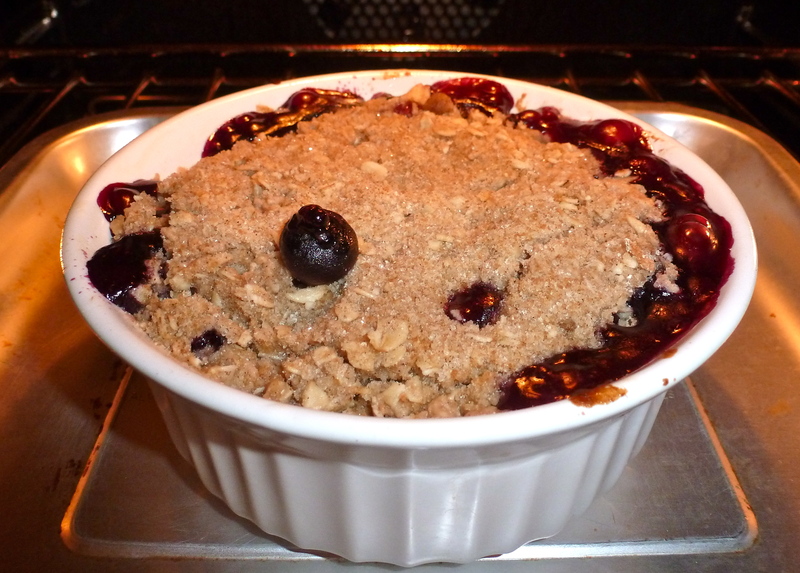 I wish I had baked the second crumble instead of putting it in the freezer last night…seems like a decent breakfast. First things first: You don’t like pies!?!? Now that I have that off my chest, I have to give you propers on the rest. It looks heavenly. Well done! Right? PIE. And I call myself an American! I must try. I love thai food! Go goddess go! 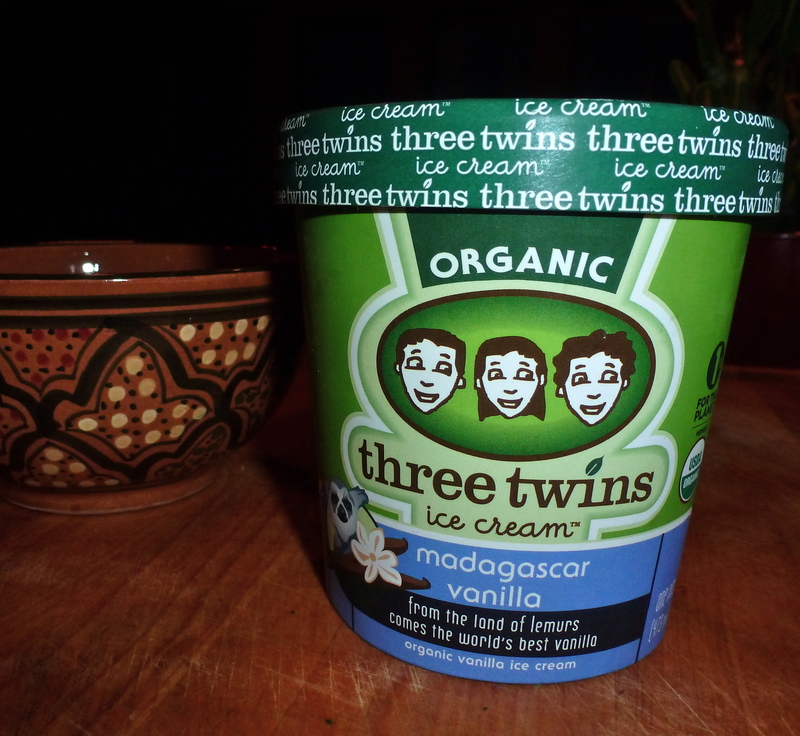 It was REALLY good- happy to share the recipe! It was! Both of them! Yay for leftovers! I’ll send them to you tomorrow! Happy to share!